Here goes our top ten list of most comfortable cars for the year 2013. Most of us believe that only luxury cars offer highly comfortable driver but in fact, you can even enjoy comfort without buying the most expensive car. With more and more industrial advancements, things are moving fast and old-fashioned cars are becoming obsolete. Now spend less and have all the comfort just like in an executive car for no additional cost. When it comes to comfortable car, you think of easy, smooth and relaxed drive whereas luxury car is loaded with state of the art components. 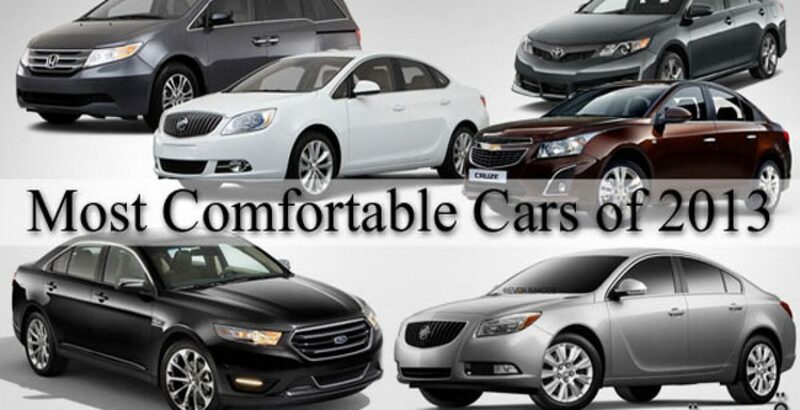 Scroll down to read more about comfortable cars for the year 2013. At the tenth position is this car with spacious seating, silent cabin and a suspension that osmoses the potholes. The latest 2013 model of Ford will be coming with even more enhancements. The coming model will allow a total separation from outside roars. This Chevy wins the ninth place in the list of most comfortable cars for 2013. Being a compact car, Chevy Cruze is an average road machine but still manages to appear at a good rank. How? With its triple layered door seals, extensive fender layers and windscreen laminated with acoustic material, which let you enjoy a quiet, comfortable and superior drive. Buick is quite obvious to appear in the list since these vehicles are popular for delivering comfort. Known for their comfort features, Verano still is one of the highly affordable cars in the town. The 2012 Verano, considering the price, was an impressive launch, offering a quiet cabin and smooth suspension on a compact platform. Camry is already being appreciated for it smooth driving and becoming the best selling perennial car in U.S. Earlier the car was completely redesigned in 2012. The new model has even more appealing interior than ever and more quiet on highway serving a high comfort zone. The second entry from Buick manufacturer takes the sixth place in most comfortable cars’ list but this time with Regal. Besides keeping the Buick badge of comfort and quietness in the market, Regal has been equipped with sportiest look and style. Generally, any minivan can perform the purpose of moving people. This new Honda Odyssey besides being the passenger mover delivers excessive comfort too. Spacious room for legs at each row, super soundproof cabin and supreme interior, this vehicle raises the reputation from basic minivan to high-class enjoyable drive. With its 4-wheel drive the car’s road grip is outstanding and well-supported seats grip your body. Even more, spacious inside room, supportive navigational controls and clear front vision, make this car a great way to put you in comfort and ease on road. Passat takes the lead to third place in top ten most comfortable cars. The Volkswagen is the proof of superior driving dynamics. By satisfying the driver’s experience, the vehicle is perfect for road potholes. Spacious back seating enhances the comfort of Passat from better to best. The all-new Chevrolet Malibu delivers the means of luxury and affordability together. This vehicle offers reality of mid-sized sedan together with spacious cockpit. The suspension of the car is capable of refining the U.S endless supply of crumbling asphalt. When it comes to comfort, the new Chrysler 300 is unparalleled in most comfortable cars in the world. The car is classy, quiet and reflects the luxury at a sneak peek. The car besides being perfect in comfort offers keyless entry and ignition start and big touch panel of 8.4 inches.